When illustrated using circle notation, it’s easy to grasp the underlying symmetry of the prototypical 4-loop tennis net. In Line 2 of chart 5, the passage of the index loop up through the thumb loop is counterbalanced by a symmetrical passage of the middle finger loop up through the little finger loop. In Line 3, the +2/2 rotation of the thumb loop is counterbalanced by a -2/2 rotation of the little finger loop. The symmetry in the chart is reflected in the woven design. Many beautiful variations of the prototypical 4-loop Tennis Net can be designed on paper, long before they are formed on the hands, by simply altering its circle notation chart. Below are a few examples. Variation 1 (fig. 27, chart 6, page 254) is a greatly simplified version of the prototypical 4-loop tennis net (fig. 25, chart 5). 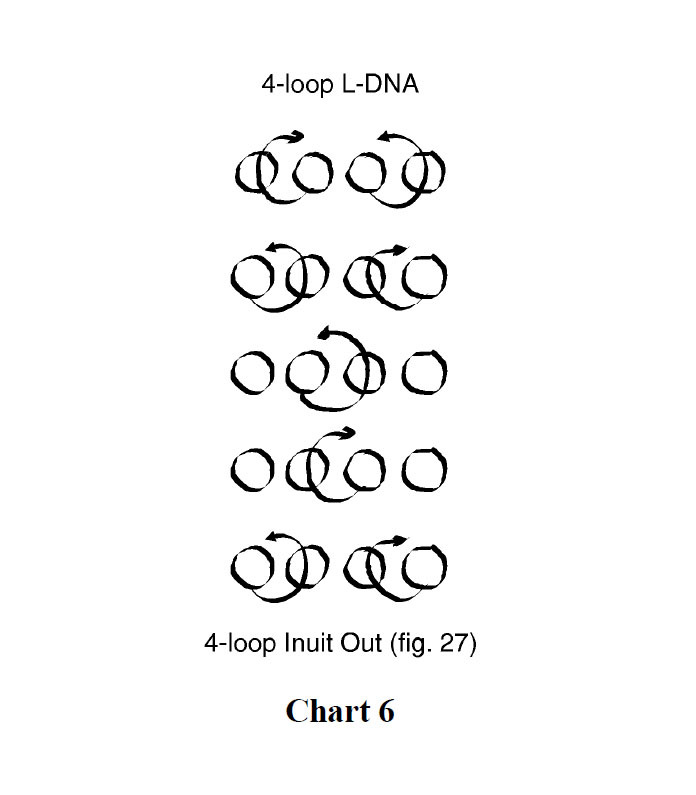 When chart 6 is compared to chart 5, one immediately sees that all loop rotations have been omitted and the weaving sequence is done only once (use a loop made from a 2½-span string for this simple net).